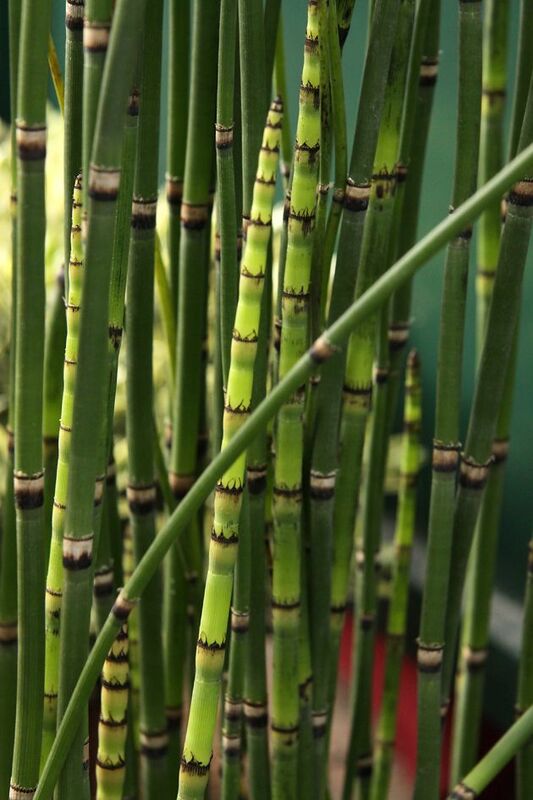 Equisetum hyemale is a cryptogram, perennial evergreen herb, from a widely creeping rhizome, densely, often extensively, colonial; stems 0.2-2 m tall, 0.3-1.7 cm thick, green, finely ridged, unbranched, rough-textured, interior hollow. Leaves reduced to toothed sheaths around each node, teeth narrow, tips pointed 1.5 cm, margin toothed, black banded at tip; teeth falling (deciduous) from sheath. Equisetum hyemale photo_file_PDB_101KB.commons.hortipedia.com (Accessed 4/2017). Spore cone dark, at top of stem, to 2.5 cm long, with point at tip; produced May to Sept.
Habitat: Open, scrubby or partly shade areas in moist to wet soil. 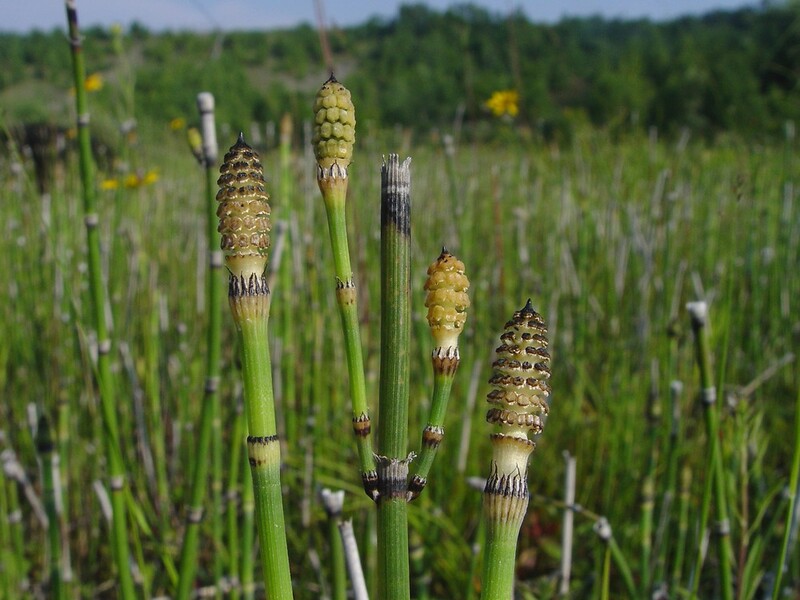 Equisetum hyemale spore cones.By Donald Cameron. Copyright © 2015 Donald Cameron (Accessed 1/2015). 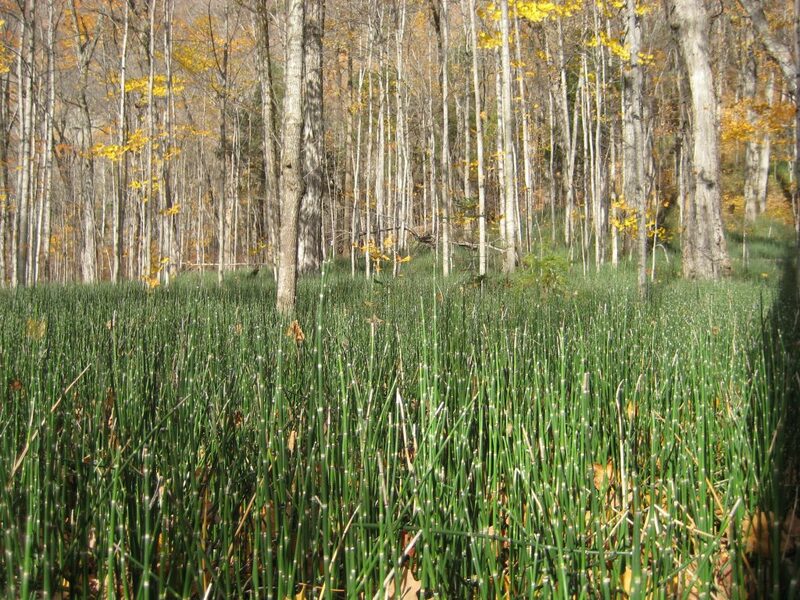 Notes: Cell walls contain silica deposits as is typical for all Equisetum species, (Cody and Wagner 1981). Apparently easy to transplant but can become aggressive (Montgomery and Fairbrothers 1992). Equisetaceae originated in the Devonian period of the Paleozoic Era, 360-250 million years ago, and were dominant land plants in swampy regions during the Carboniferous period of the late Paleozoic. Thus their fossils are common in coal deposits (White 1990; Scheper 2007).